With Uruguay drawing 1-1 to Paraguay earlier in the evening, Jamaica became the first team to be eliminated from the tournament without even kicking a ball against Argentina. Playing for pride was the incentive and they more than held their own, surrendering only one goal to the two-time Copa América and World Cup champions. Here’s an account of how they did it as well as a general review of the whole campaign – What went well? What needs improving on? What next? The most obvious plus point is the fact that Jamaica were able to keep the scoreline so low. Everyone knows about the sheer quality that Argentina possess, a team packed with superstars from all over the world, yet Gonzalo Higuaín’s 11th minute strike was the only time when the South Americans hit the net. 27-year-old Swedish-based goalkeeper Dwayne Miller was selected ahead of Duwayne Kerr, who started in the previous two outings but his embarrassing error in the Paraguay defeat might have cost him. If it wasn’t for Miller’s reactions and athleticism in between the sticks then it could have been much more. In fact, Miller had the most touches out of any Jamaican player alongside captain Rodolph Austin (51), emphasising how busy he was throughout. Lionel Messi was influential but not as influential as he can sometimes be. He made the most passes out of any player (95), 61 more than Jamaica’s highest pass maker Austin, but despite this the Barcelona maestro failed to assist or score. Keeping him off the score-sheet is certainly not easy and Jamaica managed to do it. The Reggae Boyz really did put everything into their performance: 20 clearances, 13 blocks, 12 interceptions and eight aerial duels won. Michael Hector and Kemar Lawrence combined to make 14 of those clearances. 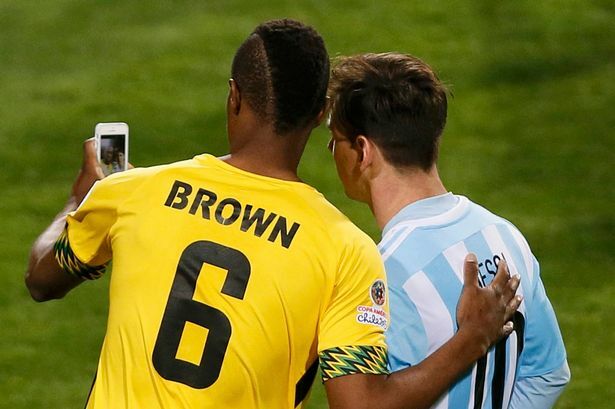 On a side-note, it was nice of Messi to stop and pose for a selfie with Deshorn Brown, who pulled out his phone and seized the opportunity immediately after the final whistle. Who can blame him? The team’s inability to score has been highlighted before and once again manifested itself. A lot of Jamaica’s play revolved around sitting in and absorbing the Argentinian pressure, however, they did have five attempts on goal but Deshorn Brown was the only player to hit the target from way outside the box. Wes Morgan had two headers from set-pieces, both wide. Statistically speaking, Winfried Schäfer’s men were the only team not to score at this year’s Copa América. They registered the third lowest shots per game (7) and the lowest shots on target per game (0.7). 71% of their attempts derived from the middle showing a lack of creativity on the flanks. Giles Barnes isn’t really a centre-forward, more of an attacking midfielder adept at playing in behind. Darren Mattocks hit a purple patch of form heading into the competition but fluffed several great opportunities against Uruguay and Paraguay, was unused on Saturday. 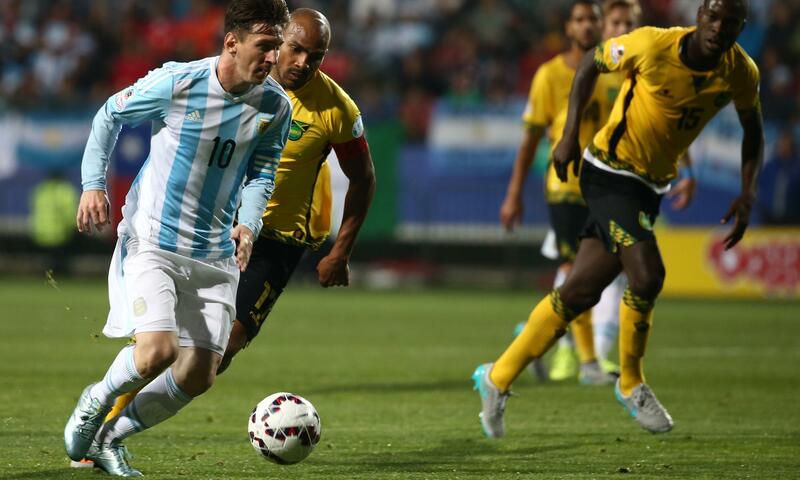 Brown ran himself into the ground versus Argentina, however, is he really the long-term answer? He’s more of an impact substitute. And the Montego Bay duo Dino Williams and Allan Ottey didn’t see any action out in Chile so it’s impossible to offer a verdict. A good quality striker is required to boost Jamaica’s ruthlessness in front of goal. Lewis Grabban? Jermaine Beckford? Dwight Gayle? These were really good performances by Jamaica in this competition. Remember the last world cup finals they went to they were humiliated by a 5-1 Argentinian defeat. Now they have held their own quite well against some of the best and some of the more aggressive teams in the world. If guys like Raheem Sterling, Sturridge, Clyne, Puncheon, etc. had chosen to play for Jamaica, as they should have, they would have one of the better teams in the world. There seems to be a problem of lack of self-respect and a lot of self-hate going on with Jamaican people. You didn’t and dont see Dwight Yorke nor Kenwye Jones trying to play for England. (Neither do you see them bleaching their skin like the Jamaicans). Something has gone wrong in Jamaica since Bob Marley and Marcus Garvey.